When you’re pregnant, there are a lot of changes taking place in your body. One of the most serious changes is the weight gain through your middle as your belly expands to accommodate your growing baby. While this is a totally natural process, you may be worried about your stomach, especially as your skin gets tighter. This can lead to stretch marks on many, which most people really don’t want to have to live with. The solution to this problem is keeping your skin nourished and hydrated, which will allow it to be able to stretch and not become damaged. Most types can also help with irritated or itchy skin and contain ingredients that are safe to use on even the most sensitive skin. In fact, many of the most popular formulas are all natural and contain organic ingredients that will keep your skin looking fresh and blemish-free. There are some that have slight scents and others that don’t have a scent, in case you are more sensitive to smells. There are so many different types to try that it may be hard to choose just one. If you have trouble choosing, you can always pick up a couple to see which one you like best. This belly butter doesn’t have any weird chemicals in it that may leech into your skin. It is paraben, petrolatum, and synthetic fragrance free. This also means that it’s unlikely that it will cause an adverse reaction to your skin. On the flip side, it does contain organic essential oils, Shea butter, and Vitamin E, to keep your skin looking good. It can protect your thighs, hips, and belly from forming stretch marks, especially since it is also packed with Omegas to keep your skin more elastic. You can use it when you’re nursing or when you’re pregnant without any harmful effects. This product is organic and even safe for you to use if you’re a vegetarian. It contains Calendula, cocoa butter, and other ingredients that you’ll be able to pronounce. The aim of the product is not only to help you lessen the appearance of stretch marks, but it can also help with itching and inflammation, so that your skin is nourished and looking good at all times. The best part is that the formula smells great. It has an orange scent that users really like. They also like that the formula isn’t messy and how a little goes a long way. If you’re someone that has a problem with scents, this is the perfect product for you. It has no scent and is produced using 99 percent natural ingredients. It combines the power of Shea, cocoa, and jojoba butters to make a creamy formula that you can use without worrying about man-made chemicals. It can be used during and after pregnancy to make your skin soft and keep you from itching. Many users reported that it prevented them from getting any stretch marks when they used it every day, and others reported their stretch marks look less noticeable than before they started using this cream. This butter is a thick formula that rubs on skin nicely, due to the fact that it is made from some of the best ingredients for your skin that you can find. There are many oils and vitamins in this product, including coconut oil, vitamin B5, aloe, and Shea butter. It’s also cruelty free and doesn’t have parabens, synthetic colors, or anything like that. It helps your skin stay hydrated at a trying time in your life, and it also provides relief for itchy or irritated skin. There is no fragrance and the manufacture even offers a money back guarantee, so you have nothing to lose if you’re interested in trying it. There’s nothing better than being able to trust the items you put on and near your body. This salve has zero toxins in it, so it is absolutely safe to use and it can help your skin stay elastic during pregnancy. This is very important during pregnancy, so your skin will look the same after you deliver your child. It also has a light chamomile and lavender scent and can ease itchy skin. It has ingredients like rosehips, beeswax, and apricot oil, so you know it’ll feel great on your skin. Users love that it isn’t sticky and feels smooth when you use it. 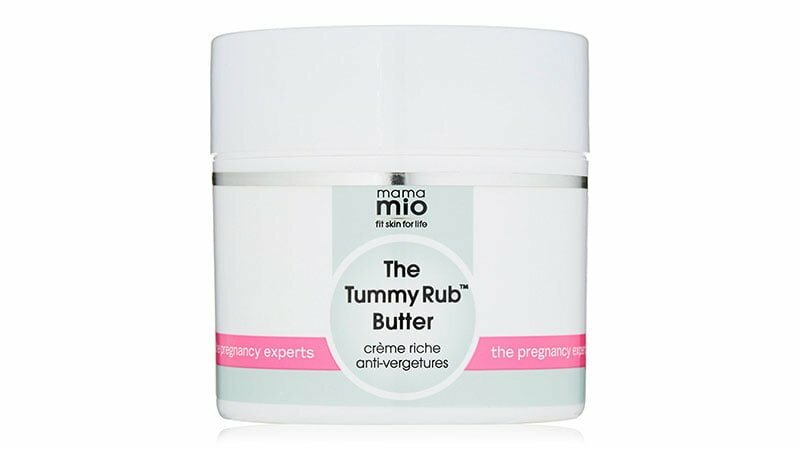 This is a product that can be used on a woman’s belly during pregnancy, but can also be used all over your body for everything from stretch marks to dry skin. It has a nice scent to it and has cocoa butter and Vitamin E in it, to keep skin smooth and tight. Many people use it regularly and report that it goes on nicely and has a great scent. It is safe to use on virtually any part of you and is great for the whole family, especially if you have old scars or small bumps on your arms or legs.